Discovering the sources, the making and display of the TASS Windows has been an intriguing piece of exploration. And that is not to mention how this rich collection, certainly the largest in the UK, came to Nottingham itself. They were not intended to outlive their original purposes to raise morale at home, attack the enemy and chart the war. They were for distribution, display and disposal, destined to become detritus as soon as they outlived their purpose. Their immediacy and immense communicative value arose from the different skills of the painters and writers who produced them, and the collective team work of the copiers. With the passing of time the Windows have become valued as works of art in themselves. Their roots in fact ran deep in Russian popular culture. 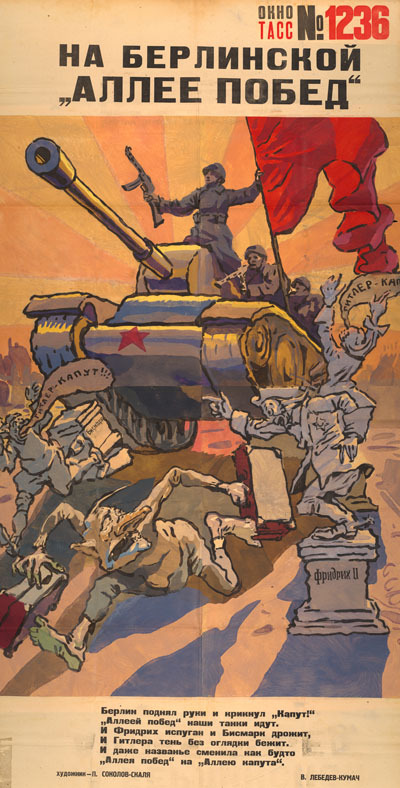 Due to low levels of literacy, the use of images to communicate had a particular relevance in Russia in the 100 years before WWII. As well as comic story-telling, the popular print or lubok might depict desirable behaviour, commemorate historical events or national celebrations. 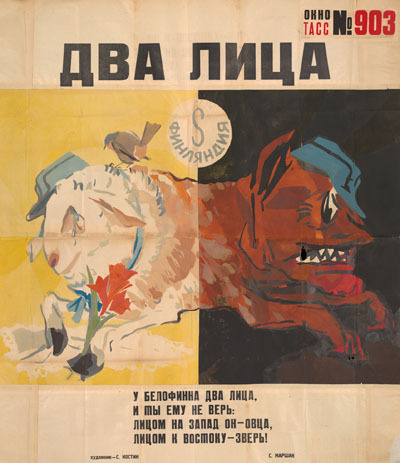 After the 1917 Revolution, the lubok was adapted to official posters. They were placed in the windows of the Russian Telegraph Agency (ROSTA) in major cities. These 'Windows' adopted the comic strip format of the lubok. They might urge citizens to work harder or caricature state enemies, such as the 'bourgeois' class. In WWII, the state needed to maintain morale on the home front. The new TASS (Central Agency of the Soviet Union) Studio was a way for artists and writers to participate in the war effort. The TASS Windows were born in 1941 on the first day of war. More than 1500 Windows, in runs up to 600 or more, were produced in the period 1941-45. They provide a unique insight into the management of the war, into what made Russians laugh, and how they viewed the enemy. This war poster shows visual influence from the comic strip. Its captions are humorous and playful. The interplay of language and picture is immediate. The posters show clearly that they are the work of many hands. An original image would be painted by an artist and a text devised by a writer. The central image was cut into squares to be reproduced. Then each square would be distributed to teams of volunteers who would produce up to 600 copies. A close look shows how the squares were glued back together. The text strips were pasted on to complete the assembly of the 'copies'. An even closer look, now possible digitally, shows the variations in colour and brush strokes as different hands were employed in reproduction of the original. The uniqueness of the posters is largely due to their collective creation by hand. Resources, such as paper, inks, printing machines and the personnel to operate them, were increasingly scarce due to the demands of the war effort. 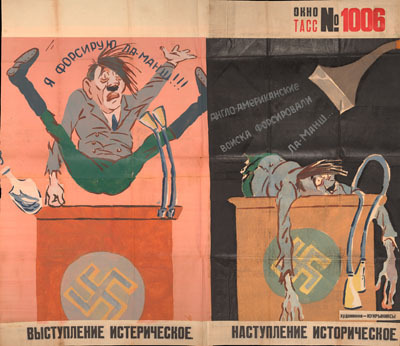 The TASS posters were displayed primarily in windows of shops and administrative offices facing on to main thoroughfares. Some were displayed in workplaces and some in the open air. Photographs show that groups of people gathered to view them and no doubt exchanged views about their content. Primarily propaganda, the Windows boosted morale by attacking the enemy, or by giving evidence of Russian stability and courage. By reacting to the most recent events they provided a running commentary on the progress of the war in Russian eyes. Their direct link to popular culture in the lubok, and the ROSTA windows reminded the Russians of their rich, traditional heritage, and the revolutionary spirit of the early years of the Soviet Union. Imagine your reactions in 1944 on seeing this image of Hitler, as a stupid mare, falling on his/her nose as he loses his position in Ukraine. And Goebbels flutters in alarm. The posters in this exhibition were a gift to the University from Vivian De Sola Pinto. Professor of English at the University of Nottingham between 1938 and 1961, Pinto left his post during the war to serve in the Intelligence Service. He served primarily in France, where he was wounded in 1940. The circumstances enabling Pinto to acquire these posters are unfortunately not known. 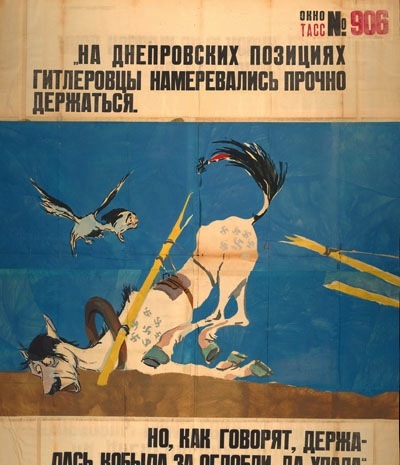 However, Pinto had co-translated a collection of Soviet war poems, published in 1945, and it is possible that he was given the posters as a gift from the Soviet government during a visit to Moscow around this time. 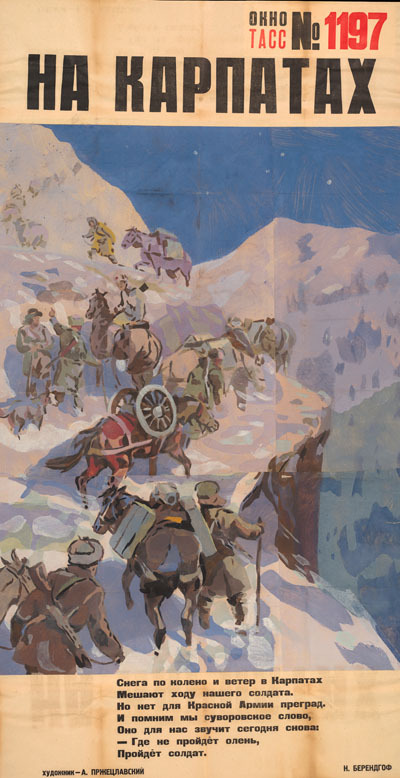 After the war, Pinto donated the posters to the University of Nottingham’s Department of Manuscripts and Special Collections. Vivian De Sola Pinto was born 9 December 1895 and was educated at Oxford. 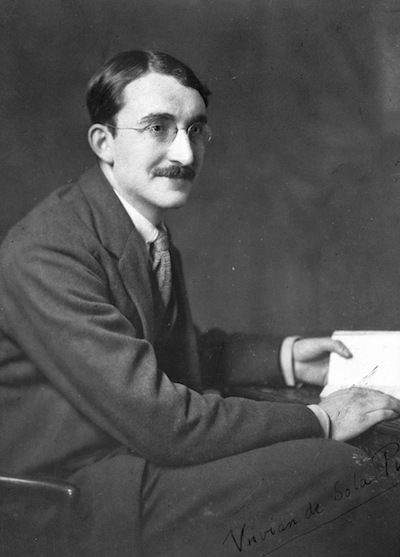 He took up his Professorship of English in Nottingham in 1938. Vivian De Sola Pinto retired in 1961 and he died on 27 July 1969. The collection of 166 TASS posters, dating from 1943-1945, was given to the University of Nottingham in 1961. Their historic importance, and the insight they give into the wartime Soviet Union was immediately recognized, but their size and fragility restricted the use that could be made of them by researchers. A collaborative project to microfilm the posters was undertaken by the University and Adam Matthew Publications in the early 1990s. Dr D.W. Spring of the University’s History Department, and a team from Hallward Library and Russian and Slavonic Studies, wrote a descriptive listing and guide to accompany the microfilm. Descriptions of the posters were later made available through the Manuscripts Online Catalogue. As technology has advanced, a digital solution became desirable for wider access to better quality images. 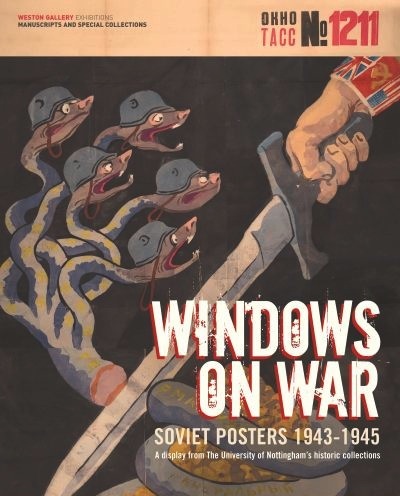 The collection was the focus of a major exhibition ‘Windows on War: Soviet posters 1943-1945’ held at the Lakeside Arts Centre at the University in 2008-9. It was a collaboration between Manuscripts and Special Collections and the Department of Russian and Slavonic Studies. Much of the material displayed was digitised to its original size, and the stunning colours of the posters which had been preserved, despite their fragility, were reproduced. Size and colour overwhelmed spectators as much as they had done during the war. Lectures, workshops, talks and educational activities attracted a wide range of public interest including school students, art experts and enthusiasts as well as those who came to remember the war. There are many challenges to conserving these posters, from fragility to large size and structure. The paint, however, has mostly remained vivid and intact, as the posters have not been exposed to much light during their storage. Yet there are some tears from folds, and where the paint, brittle with age, has caused the paper to split. Some of the posters are over two metres tall, and made up of smaller sheets of paper that are overlapped and glued together. Excessive handling could cause more damage. The role of the conservator is to preserve these documents for the future. This includes fixing the tears with Japanese tissue and wheat starch paste to prevent further damage, and in-filling missing fragments and corners. Once the posters have undergone conservation, they will be stored flat, in a cool, dry atmosphere. The posters are a valuable resource for research and learning, but need to be more accessible to everyone. 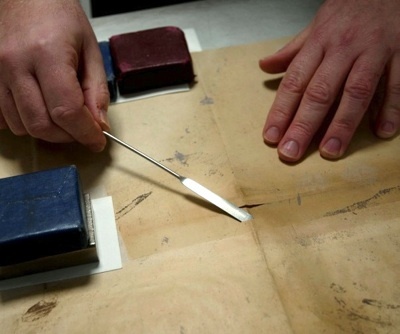 To increase access to these delicate documents would mean more handling and a greater risk of deterioration. 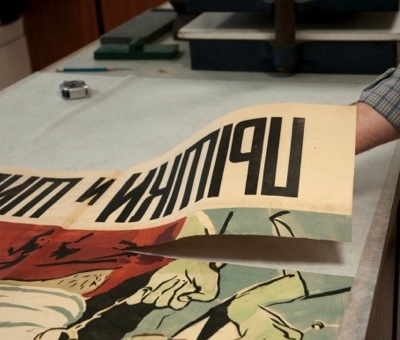 The best way to preserve the original posters is to provide digitised versions. 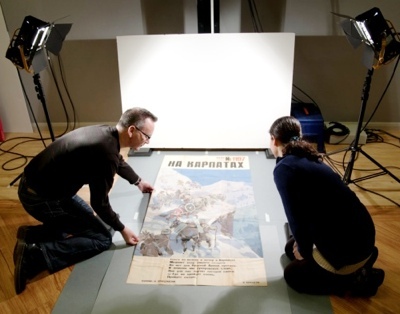 Digitisation is the process of creating digital images of posters, books or even 3-D objects. The viewer can now zoom in and see brush-strokes in the paint, joins in the panels and evidence of production techniques. The long posters have to be scanned in sections by a large-format camera with a digital-scanning back, controlled by a computer. These are then digitally stitched together to make a master image. These ‘masters’ are then used to make derivative files of different sizes and quality. These fit-for-purpose images include high-quality reproductions for display, exhibitions, and small prints in books or as postcards. Alternatively, digital copies can be made accessible online, to be browsed and examined freely as before on this website. A multi-skilled and multidisciplinary team was formed from Manuscripts and Special Collections, IT Services and the Department of Russian and Slavonic Studies. The aims of the project are to create an online version of the 2008-9 Lakeside exhibition 'Windows on War' and to utilise the occasion to extend the conservation and digitisation of the posters. Beyond those, lie the creation of a medium appropriate to the striking originality of the posters; the evaluation of the project as a model for future joint projects; and the production of a site as a basis for future online exhibitions. Extra funding has been provided by the Centre for Russian Central and European Studies (CRCEES, Glasgow) of which Nottingham is an institutional member. CRCEES itself is funded by the AHRC and British Academy. The team has had to face questions generic to the presentation of artefacts and communication of research. Visual presentation and text have been reworked from the physical exhibition to a form more appropriate for online. “Fresh forces going to the front”. 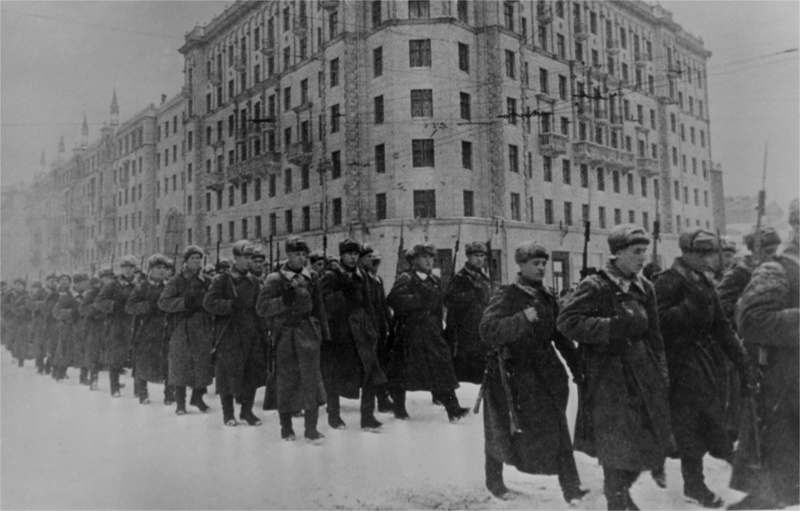 Fresh forces going to the front from Moscow.